It is with tremendous excitement that the members of the Pastor Search Committee announce their recommendation for the next pastors of First Baptist Church of Savannah, Revs. Katie and John Callaway. 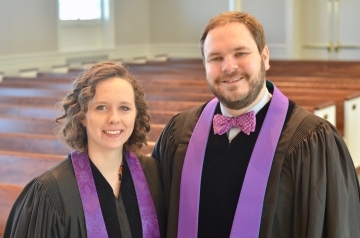 John and Katie have worked together as a team in many settings during the past several years, including First Baptist Church, Carrollton, University Baptist Church, Baltimore,and currently First Baptist Church, High Point. The Callaways would become co-pastors of First Baptist, jointly undertaking the responsibilities formerly held by John Finley and Lauren Colwell. They would not be Senior and Associate pastors, but instead would share all responsibilities including preaching, pastoral care, spiritual formation, children and youth, etc. This will be a new model for our church and a description of how it would work is outlined at fbcsavsearch.org/newpastors. The Search Committee will present the Callaways to the church in a series of events the first weekend in April.